Hetfield90's Mega Man X 100% v3 TAS in 33:07.1. It is 391 frames(6.5s seconds) faster than the published run. Emulator used was BizHawk 1.11.6. I decided to do a v3 of this category to incorporate the strategies NrgZam discovered in his recently published any% run. I didn't expect to shave this much time off(4-5 seconds was my initial prediction), but the majority of the time save came from better lag reduction(particularly on boss explosions), followed by reverse wallkicks, followed by other minor discoveries. The only time-saving glitch forgone is the blackout glitch after each boss, which would save a total of ~3.7s at the cost of having soft music for the majority of the run. 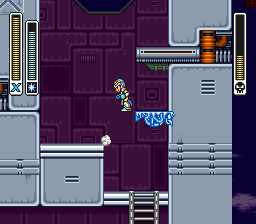 Phantom grab - Collecting an item with a boomerang on the same frame that a miscellaneous object (life energy, weapon energy, extra lives, hearts, e-tanks, floating platforms, boss doors) spawns will cause the object to replace the collected item inside the boomerang. This was utilized in this run a total of 11 times to change the route, skip a boss, achieve flight, and expedite the collection of the majority of items required for obtaining the hadouken. Ice sled zip - Positioning X to be inside of an ice sled will zip X out of the way when the sled manifests. This can be used to bypass camera scroll triggers as well as zip through walls. Reverse wallkick - Pressing left+right the frame before walljumping off a wall on X's right side will turn X around and jump off an invisible wall to the left. This is particularly useful in getting over small walls that require only 1 wall jump, but also facilitates faster wall climbing on single walls and a variety of other situations. Here's a table of the average speed for each walljump interval. Alternating between going down to 915sub-ppf(reverse wallkick) and 403sub-ppf(normal wallkick) yields a slightly higher average vertical speed than consistently going down to 531sub-ppf on each jump, which was previously the fastest method of climbing a single wall. Luck manipulation - Unlike in X2 and X3, X's RNG manipulation techniques are very limited in this game. Killing an enemy or creating a dust sprite via a wall slide increments RNG by 1 value, and breaking an ice sled increments it by 12(which can only be used during vertical movement, since it despawns offscreen before it shatters during horizontal movement). 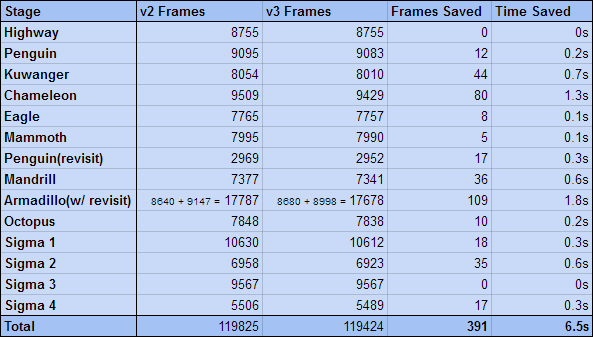 RNG also increments 1 value every frame, so waiting around for 1 or more frames can be used as a last resort. This stage was unchanged. A few lag frames can be saved on the bee crashes but then you just lose it to load times at the end of the stage. Boss explosion lag seems to be based largely on the global timer. Often, delaying a boss kill by as little as 1 frame cause save upwards of 20 frames worth of lag during the explosion. With the addition of a reverse wallkick in this phantom grab, I was able to fire the boomerang much earlier and arc it upwards initially to get it down into the pit more quickly. The miniboss decided to jump a lot this time around. I only lost 1 frame during the fight as a result, which is at least the same amount of time I would have spent manipulating a different pattern. 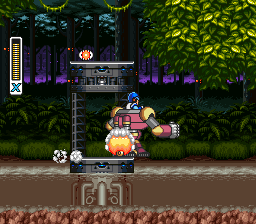 Weapon swapping to reduce lag was particularly effective on this stage. I'm not sure why, but it didn't really work as well any other stages. The phantom grab might not look nearly as spectacular anymore without all of the juggling, but it's now theoretically perfect since I didn't get any lag frames nor have to slow down my movement. I'm not why I didn't use this this enemy's drop in v2, but I'm going to just assume the RNG wasn't in my favor. A lot of lag was reduced during the Thunder Slimer fight by killing two of the bubbles. The reverse wallkick during the heart phantom grab allowed me to save 9 frames over v2 by firing a boomerang to the left while climbing the right wall. I got massively boned by RNG on the Mandrill fight. Him not dashing at the start of the fight loses 4 frames, which is the same amount of time getting an extra life for the e-tank phantom grab in the next stage saves. Even if there was a dash pattern I could have reached by breaking an additional ice sled during the stage(which there wasn't), it would have pushed the RNG too far for me to get an extra life in Armadillo. For reference, extra lives have a 1/128 chance of dropping from enemies with standard drop tables. I could have also potentially chanced the e-tank grab during the revisit, but since you can't create dust sprites underwater during the Octopus fight before it, that wasn't a risk I was willing to take. The vast majority of this time save is from lag reduction, particularly from the c-sting/tornado usage before the second cart ride. Reverse wallkicks also saved a bit of time. The phantom grab was done more optimally, and I was able to get an extra life for it which didn't happen in v2. The reverse wallkicks during the bossfight allowed me to get a better doppler effect on my mid-fight charged E-spark. Better lag reduction, namely from killing the searchlights during the submarine fights and taking damage from the torpedo to gain i-frames. The majority of the time save here is from lag reduction during the first phantom grab. Since I wasn't able to take damage during the last Armadillo visit, the majority of the manipulation for this extra life had to be done during the second to last visit. RNG manipulation like this that spans over several stages would have been practically impossible without the power of the Tudio. One thing I didn't notice until this TAS is that if your sub-pixels are far enough to the left during the Vile skip, you trigger the second door a frame later but further to the right, and subsequently prevent the black text box from appearing during the Vile fight by being in the room for 1 less frame. This reduces around 10 lag frames when Zero is breaking out of the prison. The nearest straight down Bospider drop was far enough away that reaching it resulted in a net 16 frame loss over what ended up in the run. This particular double crossover pattern is actually the 3rd fastest pattern in 100%, and not much slower than a straight drop since Bospider accelerates dramatically after the first time she crosses over(the second fastest pattern is a double crossover with the first one being at the top position). Single crossovers are slower since Bospider ends up in the middle of the room, giving you a 9 frame walk to the center of the room after the fight. This is the same Rangda pattern as in v2. It's only a few frames slower than starting with a left blue eye, but I wasn't even close to one of those. 0 frames saved on this stage thanks to Mandrill, once again, boning me with his RNG. This Chameleon pattern is extremely rare, so I had to delay 4 frames after Chameleon to get Mandrill to dash. Incredibly, top route is actually faster at the end of the stage if you get up there with a reverse wallkick. The movement itself is of course slower, but the majority of the lag in that room is caused by leaving the flying enemies alive. With this route, I was able to save the 4 frames that I lost to Mandrill manipulation. Most of this time save is from the Jedi Sigma explosion. The reason I didn't buffer the hadouken on that fight was, in fact, to get better lag reduction on the explosion. 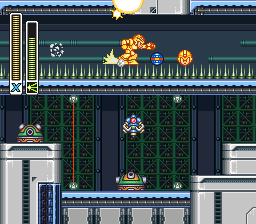 Since this is my 3rd 100% run of this game, I of course had to do 3 hadoukens on the Velguarder Sigma fight. Apparently there is some way to zip into the body armor capsule from the right as it's coming out of the ground, but I couldn't figure out how to do it and the only video of it is lost somewhere in cyberspace. This would save a few frames by being closer to the center of the capsule when you dash into it. It might be faster to get underneath the ship as it pushes you down into the heart area in Octopus' stage, but it would definitely cause a substantial amount of extra lag. I didn't consider this as a possibility until it was brought to my attention while I was well into the fortress stages. NrgZam: for his work on his recently published any% run, where he discovered reverse wallkicks and a number of other time savers that were applicable to 100% as well, and for providing the encode. Fractalfusion: for his LUA script which I used to make this run, and for disassembling the game's RNG. Manipulating Bospider and the extra lives for the phantom grabs would have otherwise been impossible. ...I accept this movie to obsolete the previous movie!